Along with red, green is the color of this holiday season. And bright green is showing up in more than just decorations. In Guangdong Province in Southern China, ten transgenic piglets have been born this year, six of them since August, and under a black light, they glow a greenish tint. A technique developed by reproductive scientists from the University of Hawai`i at Mānoa's John A. Burns School of Medicine was used to quadruple the success rate at which plasmids carrying a fluorescent protein from jellyfish DNA were transferred into the embryo of the pig. Drs. Zhenfang Wu and Zicong Li of the South China Agricultural University have detailed the research that produced the transgenic pigs in an academic manuscript recently submitted to the Biology of Reproduction journal. Dr. Zicong is a UH alumnus. Also assisting in the manuscript was Dr. Johann Urschitz, an Assistant Research Professor in the UH medical school's Institute for Biogenesis Research (IBR). Credit: South China Agricultural University in Guangzhou, Guangdong Province, China, 2013. 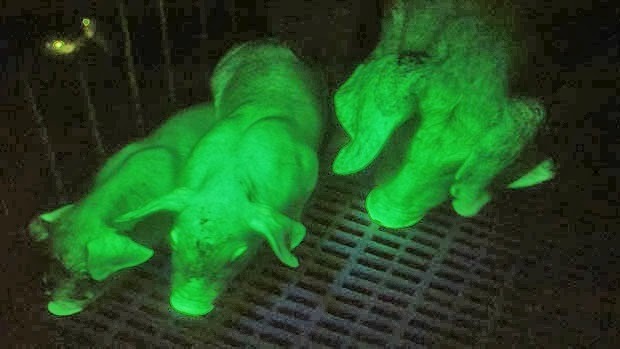 In a video accompanying the research, the pigs not unlike human children afraid of the dark begin to squeal when the lights are turned off, except for the black light, which helps illuminate the green tint. 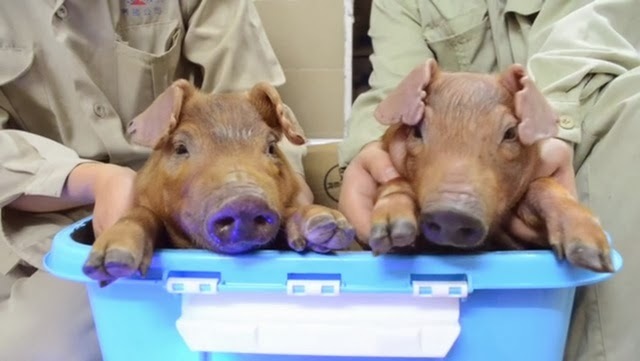 The noise is because the scientists are holding the by-now-large piglets in a container to prevent their movement, to make the florescent glow most visible. The green color simply indicates that the fluorescent genetic material injected into the pig embryos has been incorporated into the animal's natural make-up. "It's just a marker to show that we can take a gene that was not originally present in the animal and now exists in it," explains Dr. Stefan Moisyadi, a veteran bioscientist with the IBR. Dr. Moisyadi said the animals are not affected by the fluorescent protein and will have the same life span as other pigs. "The green is only a marker to show that it's working easily," he said. The ultimate goal is to introduce beneficial genes into larger animals to create less costly and more efficient medicines. "[For] patients who suffer from hemophilia and they need the blood-clotting enzymes in their blood, we can make those enzymes a lot cheaper in animals rather than a factory that will cost millions of dollars to build," Dr. Moisyadi said. The IBR technique involves proprietary pmgenie-3 plasmids conferring active integration during cytoplasmic injection. This technique was also used to produce the world's first "glowing green rabbits" in Turkey earlier this year. Turkey is expected to announce results of similar research involving sheep in the New Year.